This morning I was craving a cookie. Wait…is there something wrong with me? Do normal people wake up craving a really good cookie? I don’t want bacon and eggs, I want a cookie. Anyway, I am quite picky about the look of a cookie. I want it to look so good that it speaks to me, says something like, “I am so irresistible, a taste adventure, so worth the calories”. When I took these babies out of the oven I swear I heard one say, “Hey lady, we speak your language, and who cares what time it is”. There is granola in these cookies, so, we have the whole breakfast thing covered, lets eat! Preheat oven to 375°. With electric mixer, cream butter, peanut butter, sugar, and brown sugar. Add egg and vanilla; mix well. 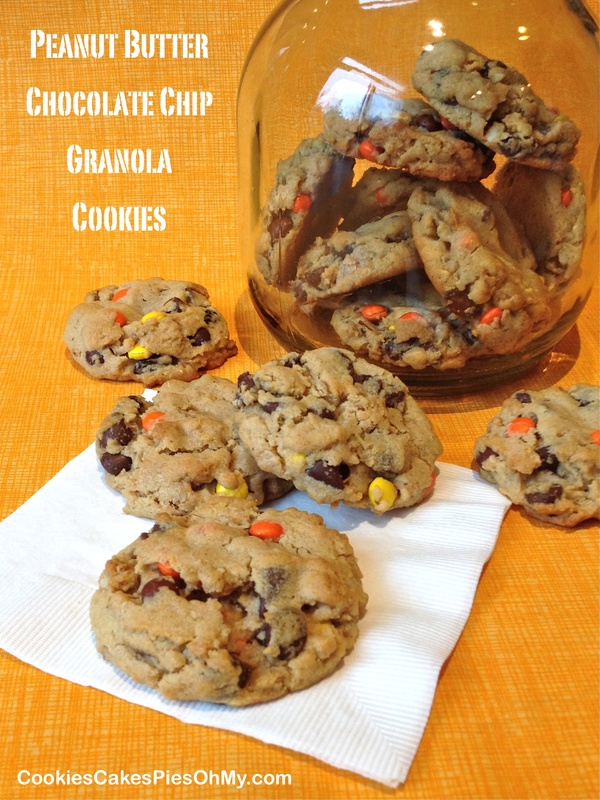 Add flour, baking soda, salt, granola, chocolate chips, and Reese’s Mini Pieces and mix just until combined. Drop by scoopfuls onto slipat lined or lightly sprayed baking sheet, press each scoop of batter down slightly to flatten (bottom of a glass or fingers work!). Bake 9-10 minutes, do not over bake. Cool on baking sheet for a few minutes and remove to cooling rack. Makes about 30 2½” cookies. Adapted from a Southern Living recipe on myrecipes.com. I’m so glad! Have one, you deserve it!